Rising Americana star playing Albany venue on February 25. Every day on my way in and back from work at saratoga living, I crank the radio in my Honda Fit. Call me old fashioned, but I still enjoy listening to the stations I grew up on in Saratoga Springs—PIX 106.5 and WEQX 102.7—as well as some of the new discoveries I’ve made since moving back up here from New York City. One of my favorite recent finds has been WEXT 97.7 (it’s actually 10 years old, so it’s anything but “new”). That’s usually my after-work, chill-out playlist—the one I turn to as I’m hurtling down the Northway to my home in Troy. Late last year, my favorite WEXT DJ, Chris Wienk, started dropping a female vocalist’s tunes into my evening lineup. 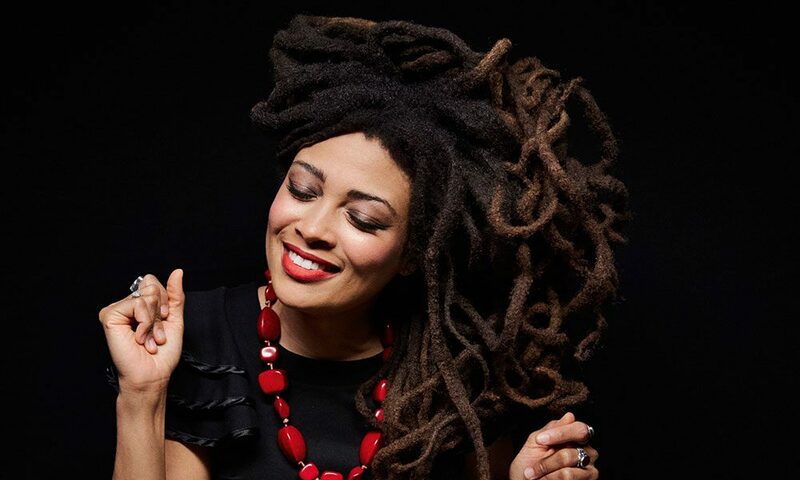 It turned out what I was listening to was Valerie June—who sounds like Diana Ross fronting the Revolver–era Beatles. Born in Memphis, Tennessee, and now based in Brooklyn, New York—though she’s on the road some 200 days per year and doesn’t really have a definable “home”—June has quickly become one of Americana’s most buzzing young artists. Blending strains of soul, blues, folk and cosmic country, June’s two most recent offerings landed her on the Billboard charts and brought her critical acclaim. While such a mature, retro sound might lead you to believe that she’s been in the music business since she was a young girl, that’s anything but the case. “I didn’t start writing for and singing in a band until I was 18,” she told me from a tour stop in Honolulu, Hawaii, last year. In fact, if you were to find June—who goes by her first and middle name; her last name is Hockett—in her high school yearbook, you might be shocked to learn that she was captain of the cheerleading squad, not “most musical” in the superlatives section. Her breakout record, Pushin’ Against a Stone, landed in 2013, and was co-produced by Grammy-winner Dan Auerbach of the Black Keys. It features June’s delicate vocals drenched in reverb, with sparse acoustic arrangements. Her latest, The Order of Time, out last March, is a leap forward, sonically. The amps get turned up a bit (“Shakedown”), while she digs ever deeper into psychedelia (“Astral Plane”). June tells me that she and her band recorded the majority of the album in Guilford, Vermont—about a two-hour car ride from Saratoga Springs—holing up at a small music studio, cooking their own food and living with her songs until they were captured on tape. Guest spots included backing vocals by multiple-Grammy-winner Norah Jones. June tells me that her favorite track from Order of Time—at least at the moment—is the ethereal “With You,” which she says “lives in the creative world where I live … it’s a dream world; an iridescent and limited world.” She views the song as a quasi–“art installation,” the type that would allow a listener to get a better sense of who she is as an artist. If you weren’t able to catch June at Levon Helm Studios in Woodstock, N.Y., last December—she’s a big fan of the Band, by the way, and used to busk down in Helena, Arkansas, near where Levon grew up—you’ll have another shot soon. June will be doubling back to Albany’s the Egg on February 25. Purchase tickets here.